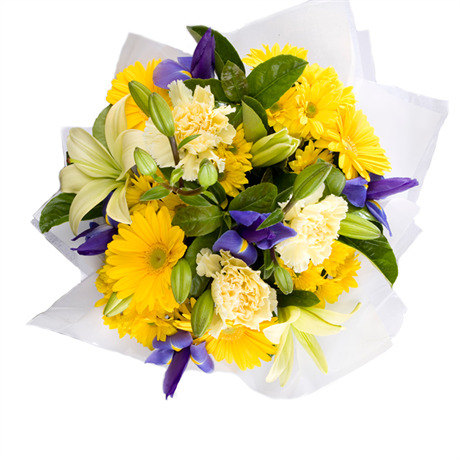 The Prince arrangement is an eye catching splice of chartreuse Asiatic lilies, sunshine yellow gerberas, indigo irises and fluffy lemon carnations. Artfully arranged in a gift box and adorned with satin blue ribbon, this visually appealing flowerscape is accompanied by a plush cobalt teddy bear (25cm in height). The fusion of bold blues and citrus yellows are traditional colours that honour the birth of a baby boy, and with the Prince arrangement you’ll exceed these expectations with style and flair. The Prince is a boxed arrangement, which means that exhausted new parents will not have to arrange these flowers in a vase. Practical, low maintenance and with something for both baby and the new parents- what isn’t to love?